Our history has expanded in depth, breadth and meaning since our very founding. 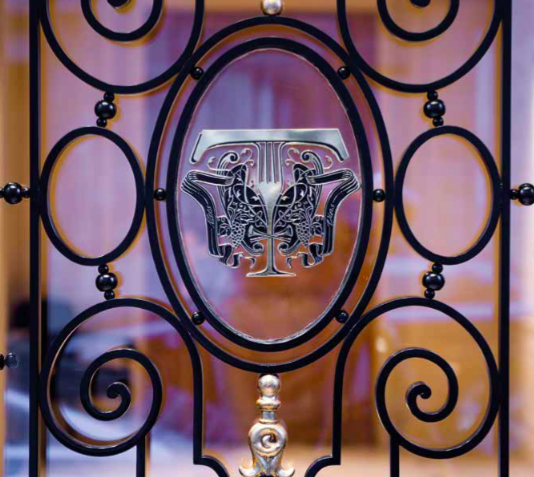 Drawing strength from venerable savoir-faire and tradition, enlivened by a generous dash of contemporary daring, Maison Taillevent has, for more than 70 years, embodied the nest in French Art de Vivre. The first French-language cookbook written by Guillaume Tirel, also known as “Taillevent”. Taillevent was first the name of a culinary legend; it is now the name of a French Grande Maison, where food and wine pairings are created and experienced with subtle sophistication and contemporary cachet. 1946 André Vrinat opens the Taillevent restaurant on rue Saint-Georges in Paris’ ninth arrondissement. 1950 The restaurant moves to the former mansion of the Duke of Morny at 15 rue Lamennais in Paris, near the Champs-Elysees. 1954 The restaurant earns its second Michelin star. 1962 Jean-Claude Vrinat begins working alongside his father, André. 1973 Another Michelin star – totalling 3. 1987 Les Caves de Taillevent opens. Jean-Claude’s daughter, Valérie Vrinat, joins the family group. 2001 L’Angle du Faubourg opens in Paris. 2008 Jean-Claude Vrinat passes away on 7 January and his daughter takes the helm. 2011 The Gardinier brothers acquire the Taillevent group from Valérie Vrinat. 2012 L’Angle du Faubourg becomes Les 110 de Taillevent. 2013 Les Caves de Taillevent opens in Beirut, Lebanon. 2014 Les Caves de Taillevent moves to a new location in Paris at 228 rue du Faubourg Saint-Honoré. 2015 In its first UK location, Les 110 de Taillevent opens in central London’s Marylebone district. Boasting 110 wines by the glass and contemporary cuisine, our London restaurant celebrates the delightful diversity of food and wine pairings. At Les 110 de Taillevent, contemporary cuisine and a unique wine menu create complementarity and contrast in a quest for flawless alchemy. The wine selection is the gateway to the meal, where each dish is paired with the wines best suited to the recipe, your tastes and your desires. They are served by the glass in two different quantities such that, in a single meal, you may explore the incredible diversity of countless potential alliances. In addition to our London location you can also find Les 110 de Taillevent in Paris. Cross the threshold of Taillevent to discover the very embodiment of ever-renewed culinary classicism. The ingredients change with the seasons, rendered more exquisite still with precise cooking techniques and sauces, served with wines aged in our celebrated cellars, where noble vintages keep company with truly great wines. The art of “gueridon” service – tableside slicing and “ambéing” – is a highlight of this dining experience. A veritable showcase of French winemaking, is your opportunity to discover one of the finest wine collections in the world. Les Caves de Taillevent carries more than 1,500 wines and spirits, from the most famous to the most elusive appellations. From among the great classics, celebrated vintages, unusual labels and rising stars, our sommeliers will guide and inspire you to ensure a truly unique, personal selection. To hear more about our history, and the future plans of Taillevent, please do ask a member of our team on your next visit to our restaurant. We’ll be happy to share more details over a glass of wine.